What would the world be like if carmakers weren't apt to appear in every single segment, and their brands weren't defined solely on how soft the interior is or how much spongier than an apple cart the ride is? Why, we wouldn't have a small SUV from Volvo to go on about. It's the Volvo XC60, which debuted today in Geneva to adoring crowds of sweater-wearing men in casual shoes. The XC60 is built for "consumers who've grown up with the microchip as a natural supplement to their breakfast cereal." That may be a translation issue, but we've heard of those kids, and pica syndrome is nothing to joke about (you'll get it later). Nonetheless, the XC60 will be powered by Volvo's 285-horsepower T6, and in Europe, a choice of two five-cylinder turbodiesels. Expect nearly half of the expected 50,000 XC60 to be built to show up in the US. Watch for them lined up outside a Montessori school near you. The new Volvo XC60 is stepping boldly into what is currently the automotive world's fastest-growing segment - dressed in a thrilling blend of muscular XC capability and the sporty charisma of a coupe. "This is not only the safest Volvo ever. If you ask me, it's also the most stunning. Not a bad combination, is it?" says Volvo Cars President and CEO Fredrik Arp. The new XC60 has its premiere showing at the international car show in Geneva in March, with the first cars reaching dealers in Europe in autumn 2008. The "Small Premium Utility" segment is growing quickly. Within the next few years, buyers will have at least ten crossover models to choose between. By 2009, this segment is expected to expand by 75 percent to 443,000 cars. "In order to succeed in that kind of competition, you have to stick your chin out and create a car that stands out from the crowd. The new XC60 bases its unique appeal on the synthesis between daringly sporty design and a range of intelligent safety systems that help the driver avoid accidents," explains Fredrik Arp. The big safety news is City Safety - a unique feature that can help the driver avoid or reduce the effects of the type of low-speed impacts that are common in city traffic and traffic tailbacks. If the car is about to drive into the vehicle in front and the driver does not react, the car brakes itself. "We are first manufacturer in the world to offer this type of feature as standard. City Safety clearly advertises that the new XC60 is the safest car Volvo has ever produced. The car is packed with our accumulated safety know-how and technology, both when it comes to preventing accidents and protecting all the occupants in a collision," says Fredrik Arp. The new XC60 will initially be available with the six-cylinder turbocharged T6 engine producing 285 horsepower and two five-cylinder turbodiesels: the D5 producing 185 and the 2.4D with 163 horsepower. All Wheel Drive (AWD) with Instant Traction is fitted as standard on all variants. "Owing to its compact dimensions - the XC60 is 20 cm shorter than the XC70 and lower than the XC90 - it continues our range of slimmed-down car models with high energy efficiency. During 2009, we will offer a front-wheel driven 2.4-litre version powered by a Euro 5 diesel engine producing 163 horsepower and with a CO2 target around 170 g/km," reveals Fredrik Arp. The chassis setting is aggressively sporty without losing anything in terms of comfort. Sitting behind the wheel of the new XC60 is in other words more of a driving experience, while the larger Volvo XC90 focuses more on providing a ride experience. Tongue in cheek, one might say that it's all about consumers who've grown up with the microchip as a natural supplement to their breakfast cereal. They're used to the immensely fast pace of development in the world of electronics - and every succeeding birthday has brought with it increased capacity in ever-shrinking gift packages. When it comes to the choice of car, these consumers adopt the same view as they do for other lifecycle products, that is to say all the properties should preferably be integrated into one single attractive and intelligent package. "We're aiming primarily at lifestyle rather than age. With the XC60 we are broadening our model range to attract even more customers with an active urban lifestyle. Like the Volvo C30, the XC60 plays an important role in our planned volume expansion strategy." The sales target for the new XC60 is over 50,000 cars per year. Distribution between Europe and North America is unusually uniform: about 40 percent each. The remaining 20 percent is destined for the rest of the world. The five largest markets during peak year 2010 will be the USA, Germany, Great Britain, Russia and China. "The fact that both China and Russia are among the five largest XC60 markets is proof that these growing markets are now beginning to be really large. Both markets will now advance even higher up the sales league in the future." 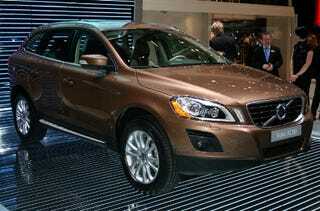 The Volvo XC60 will be built at the Volvo Cars factory in Ghent, Belgium. Sales will start in Europe during the second half of 2008, while sales in North America will get under way in early 2009.